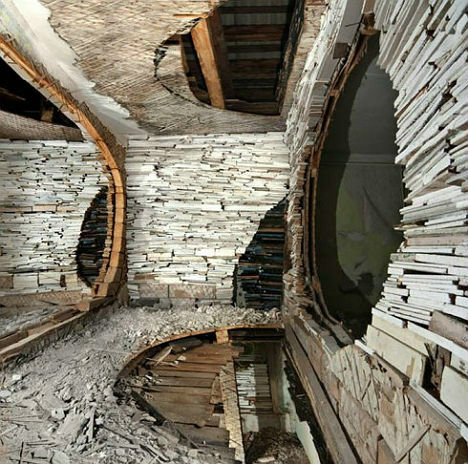 Abandoned places often seem like art in themselves; there’s a certain beauty in decay, and urban explorers go to great lengths in order to capture decrepit remains on film. But some take it one step further, turning abandonments into eerie, haunting settings for wholly unexpected art that can be surprisingly vibrant and inspirational. 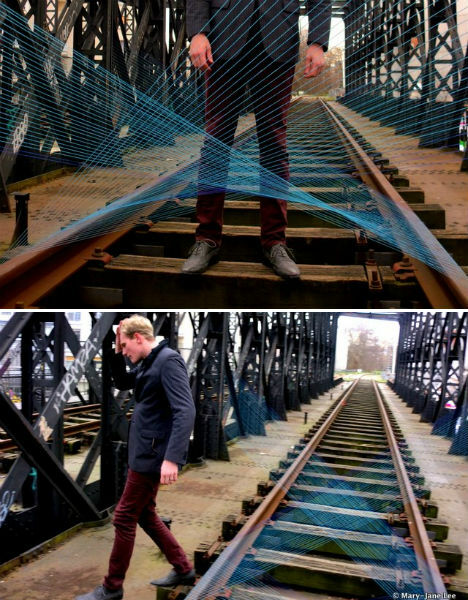 Imagine clambering onto abandoned train tracks that look out over the city of Paris. One photographer, Mary-Jane Lee, did just that, and found this beautiful and surreal sight: guitar strings, attached to the rails in an X. This guerilla work of art is so unlikely, it almost looks Photoshopped. 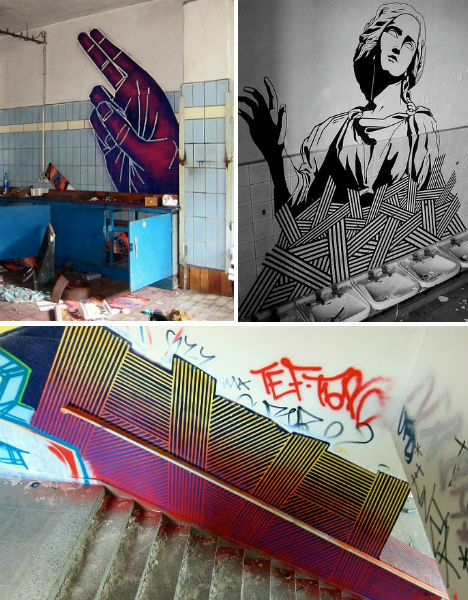 Berlin-based tape artist BUFFdiss creeps into abandoned spaces and beautifies their walls with wholly unexpected scenes like human hands and geometric arrangements. Some of his newer artworks combine tape and paint. 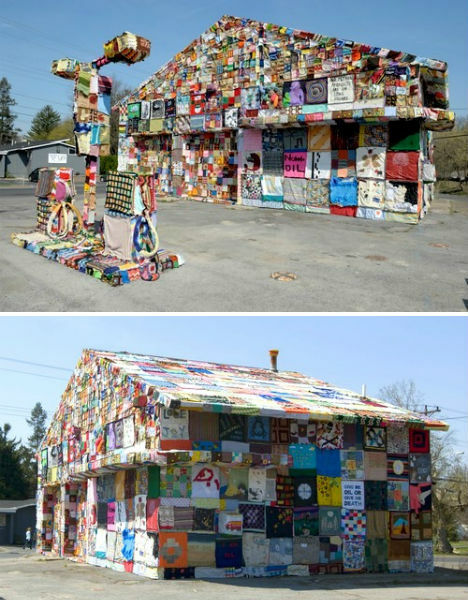 An eyesore of an abandoned gas station got a colorful makeover in the form of crocheted cozies, quilt squares, blankets and other fabrics. Artist Jennifer Marsh enlisted professional and amateur artists from 15 countries as well as over 2,500 grade-school students in 29 states to cover the 50-year-old former Citgo stations with more than 3,000 panels. 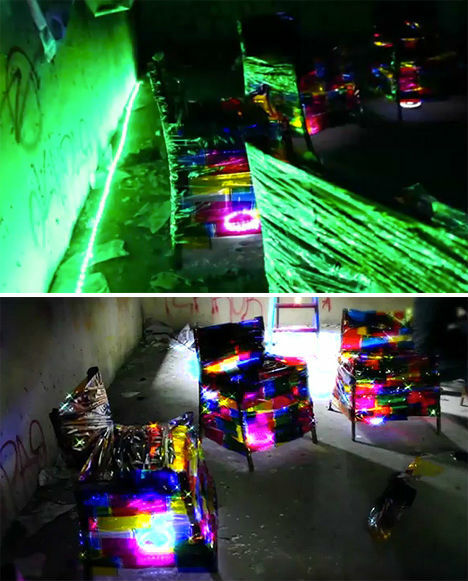 Lighting designer Luisa Alvarez transformed an abandoned house using old color-tinted photographic negatives and gels which were wrapped around chairs and other objects. 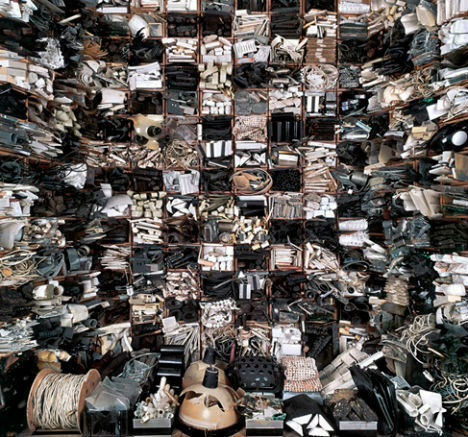 Alvarez captured her temporary project, called Habitando, on film and removed it that night. The project also featured ropes of LED lights, giving warmth to a home that hasn’t seen living inhabitants for years. An unused subway station beneath New York City was secretly infiltrated by artists starting in 2009. The illegal Underbelly Project gave each artist, including ROA and Mark Jenkins, one full night to cover a designated space. 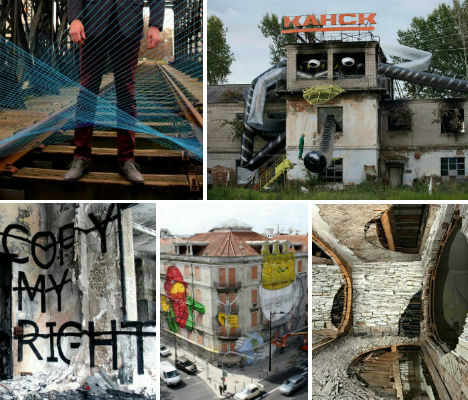 According to the show’s curators, Workhouse and PAC, the Underbelly Project is a statement on the increasing commercialism of street art, as works by well-known artists like Banksy are often removed from their urban environments and sold at galleries. The entrance to the forgotten, abandoned subway station was closed up when the project was completed in the hopes of preserving this art from money-hungry exploiters. 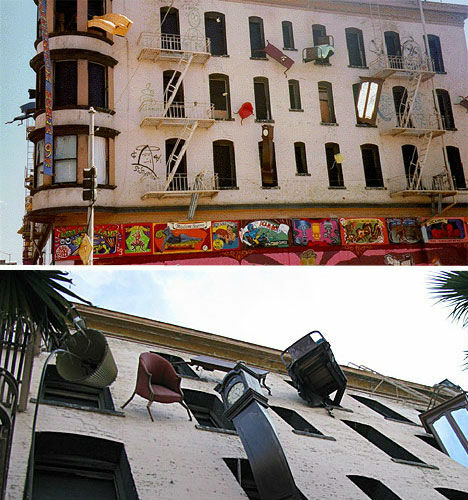 At an abandoned four-story building in San Francisco, furniture is leaping for its freedom from open windows – clocks poking their heads out and looking up at the sky, chairs making a run for it down the peeling brick walls and tables pitching themselves off the roof. The project is called Defenestration, a word meaning “to throw out of a window”, and was created by 100 volunteers. 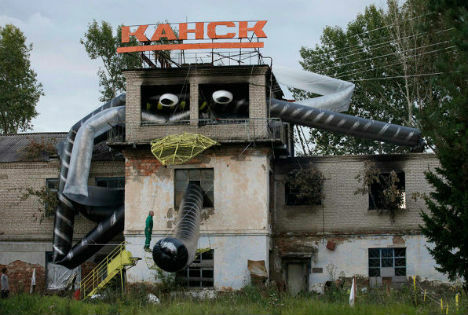 French artist Xavier Juillot installed inflatable chutes and other sculptural elements in a derelict airport in the SIberian town of Kansk, Russia for the 10th International Kansk Video Festival. Buildings that became abandoned due to industrial collapse in the city of Buffalo, New York have morphed into sculptural installations that immortalize this decay. Buffalo-based artist Dennis Maher has taken some of the city’s all-too-common abandoned residential and industrial structures and crafted their remains into sculptures that give them a new place in the world. 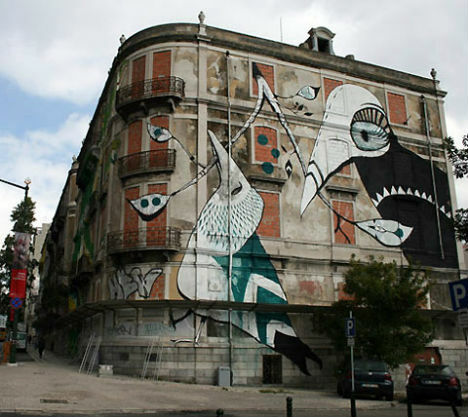 A massive abandoned building on the streets if Lisbon, Portugal is now a beautiful public mural thanks to the ‘Crono Project’, which brought street artists from around the world in to decorate abandoned structures. 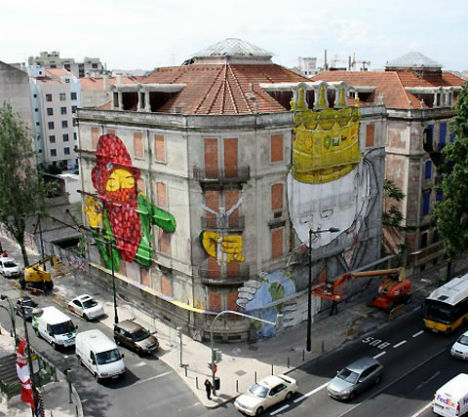 These particular images were created by BLU and Gemeos. 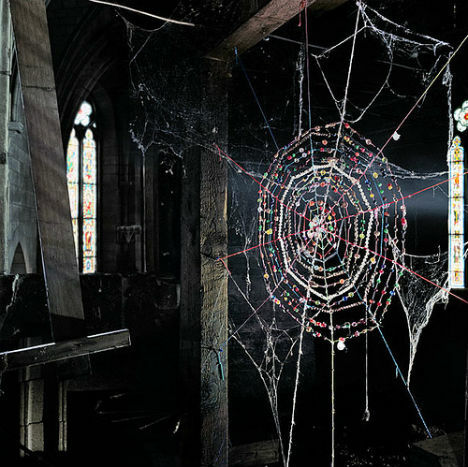 While abandoned churches no doubt have plenty of spiderwebs without the help of an artistic visitor, you can’t deny that this beaded installation is anything but charming. Information on this particular work is hard to find – if you have info, let us know! 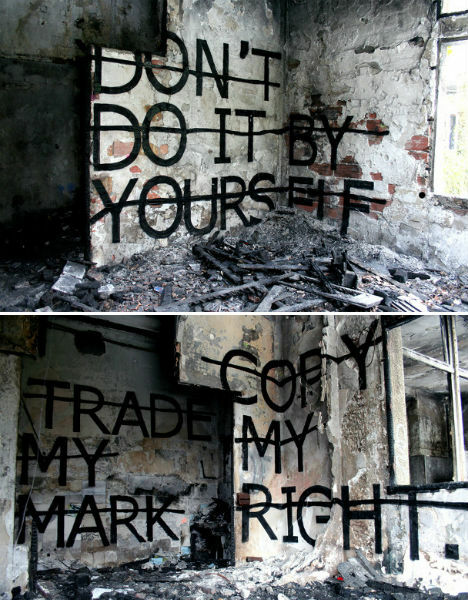 Rero, a conceptual artist with a graffiti background, applies minimalist typography to gritty abandoned surfaces in cities like Paris, London and Berlin. This series, ‘Image Negation’, was carried out in the latter. See more at Rero’s Flickr stream. The decline of Detroit is a depressing sight, with abandoned houses dotting nearly every street. These houses are a visual reminder of the sorrow of economic depression, reminding everyone nearby just how bad things have gotten. But photographer Greg Holm and architect Matthew Radune believed they could change that, at least for one such house. 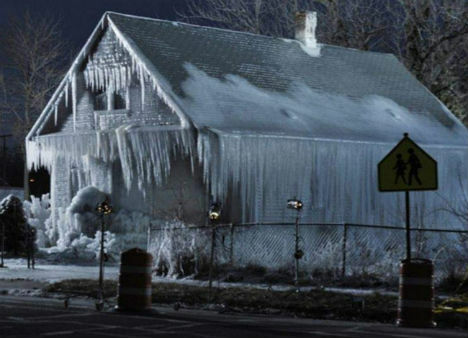 In creating Ice House Detroit, they turned a blight into a crystalline castle, giving it a sense of magic, but also helping to raise awareness about the problem. 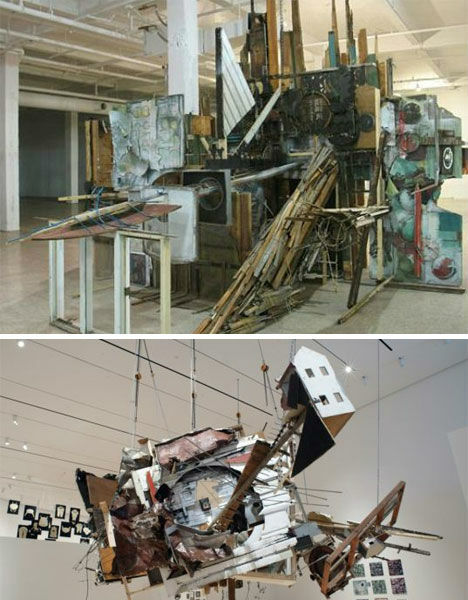 Once winter ended and the ice began to melt, the house was demolished, its components reclaimed for other projects. In this transformation, a street-side abandoned building is turned from an emblem of hopelessness to a place that actually inspires hope for the community. 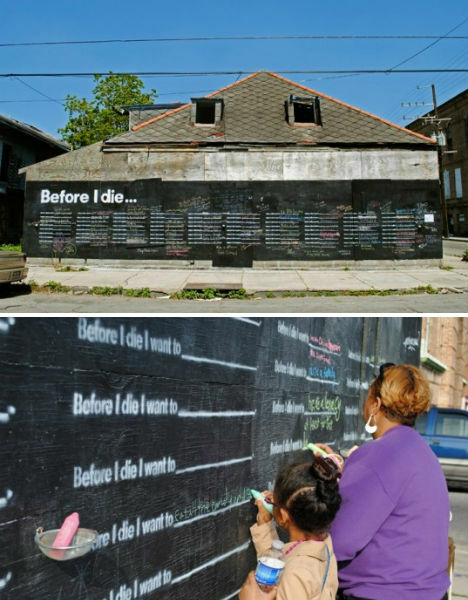 The Before I Die Project is an installation by Candy Chang which began in New Orleans, turning a building into a massive chalkboard where community members are invited to write down their aspirations and share their dreams. The project has since spread all over the country, and Chang encourages artists in other cities to try it out for themselves. 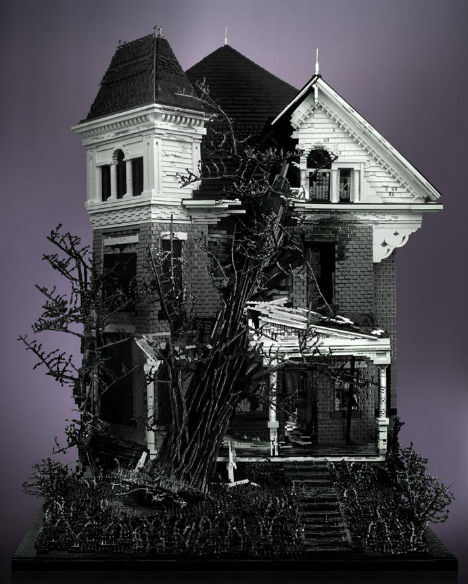 And in a work of art that’s the exact opposite of all of those featured on this list, artist Mike Doyle creates super-creepy abandoned houses out of unlikely materials: little plastic LEGOs. 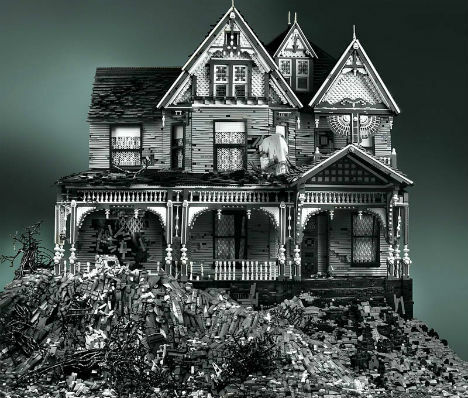 The top house alone took Doyle over 600 hours to complete using standard LEGOs that have not been painted or altered in any way. No foreign materials like wood or glue were used, and the photos were not retouched.